I’m so excited that I let a little of my southern flair show, there. That’s because I am so in love with cold weather and warm soup. Yummmmm. Last year, I started sharing soup recipes in the middle of October, when it was probably too warm to even think about soups. But you can’t stop me when I get a craving for grilled cheese and tomato soup! This year, I’ve had a little more self-control and waited to post my first soup recipe at the end of fall. It’s been consistently chilly for almost a week and a half, so I knew it was finally time to enjoy some soup. Don’t you agree?? For the first recipe of the season, I decided to continue with my love affair for bean soups. Remember this classic chili from last year and this pasta e fagioli from February?? I just love the heartiness from the beans. And they pack tons of protein and fiber, too! Well, I have another chili for you guys. This time,with shredded chicken. Say hello to my Salsa Verde Chicken Chili! For the flavor of this chili, I knew I wanted salsa verde to be a part of it. I’ve been a fan of salsa verde for a while, but only recently became obsessed with it. Remember when I talked all about it in my post for my verde chicken tostada bites? Well, the obsession lives on, folks! There are about 2 cups of salsa verde added to the chicken before we add the broth and beans. It adds the perfect amount of freshness and flavor. I sprinkle in a little extra fresh cilantro at the end to push it even further into flavor-town. If you’re new to making your own soups or chilis, you couldn’t have picked an easier one to start with! There really isn’t anything complicated about this recipe – I even use cooked rotisserie chicken so you just have to shred and add to the chili. If you have other proteins lying around that you need to use (pulled pork, roasted turkey, etc) you can easily substitute those in this recipe. Pork and poultry taste incredible with salsa verde. Make sure to add the fresh cilantro AFTER the chili is done. We don’t wanna cook the cilantro for that long – it’s best when fresh. So just sprinkle it in when the soup is perfect. I added some avocado to my chili before eating. It’s the first time I’ve had avocado in my soup or chili. And I absolutely loved it! The avocado tasted incredible covered in the spices of the soup. I highly recommend doing the same. Make sure to save about 1 cup of chicken broth for the end of the cooking process, just in case the chili is too thick for you. I do this for all my soups/chilis. Let me tell you…I am so in love with soup. I had it for every meal until it was all gone. I haven’t do that with something I’ve made in so long – I usually get sick of leftovers after a couple times. So that shows you how incredible this soup is. I hope you get a chance to make it soon – I just know you’ll love it too! Prepare your ingredients by shredding the rotisserie chicken, dicing the onion, and draining the beans. Make sure to rinse the beans, too. Set ingredients aside until needed. In a large dutch oven, heat olive oil over medium heat. Add onions and cook until they become translucent, about 5-7 minutes. Add a pinch or two of salt and stir to combine. Add shredded chicken and cook for another 5 minutes. Add salsa verde to chicken and onions and stir to combine. Add beans and 6 cups of chicken broth and stir to combine. Bring mixture to a boil and then immediately reduce heat to a simmer. Cover and continue simmering for 1 hour. After 1 hour, add cumin, chili powder, and fresh chopped cilantro. Stir to combine. Add additional cup of chicken broth, if desired. Serve immediately with diced avocado. Leftovers can be stored in the fridge for 3 days. 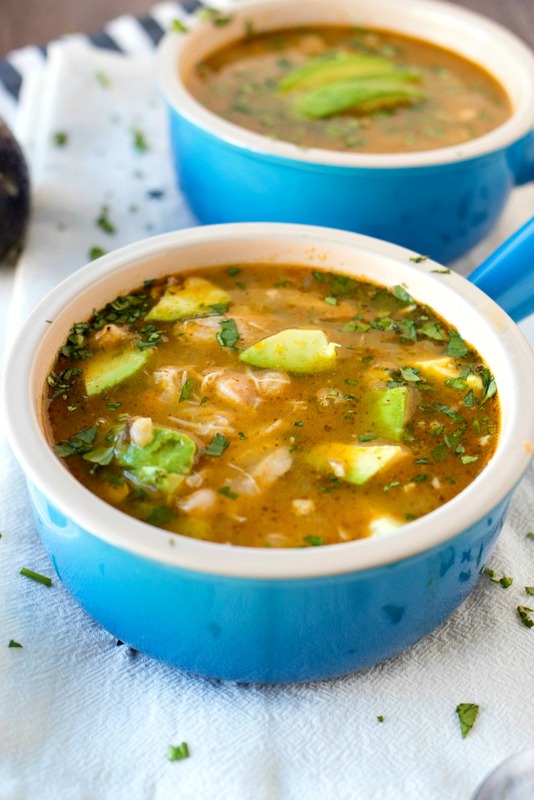 Do not add diced avocado to leftover soup that is to be stored - only add when serving. Making this for a second time today to take to a work potluck! Awesome recipe! Yay! That’s so great to hear. I am so happy you love it! YUMM!! I make something very similar, and my kids love it!! This looks amazing! We love eating chili in the winter, but get sick of the same versions over and over. This will break up the flavor a bit! This soup looks absolutely scrumptious! Such a perfect meal for the colder months. This recipe looks amazing! We would love this in my household! This looks really amazing! Perfect for winter. This looks amazing and delicious, with the weather being so horrible, this soup would totally be right for me. batch very soon. So perfect on a chilly day! Aw that’s too bad! Cilantro is so good in this soup! This is really looks good! Yummy for sure! This looks fabulous! I want to sit on the couch with a big bowl and dive right into it! Love this, so amazing for the cold weather! Can’t wait to try it. This looks so yummy and easy! I am all for avocado on top! Yessssss. I was so shocked by how amazing it was! This is perfect for the chilly nights we have coming up! Can’t wait to try it, thanks for the recipe. I had the MOST amazing salsa verde in New Mexico. This just reminded me to give recreating it a go! Looks delectable. this sounds so yummy! my husband would be so happy if i made this for dinner. thanks for the recipe. This looks amazing! Any recommendations for chicken substitutes for the non-meat eater? Thanks! Hmm not sure about non-meat subs. Maybe just add extra beans!